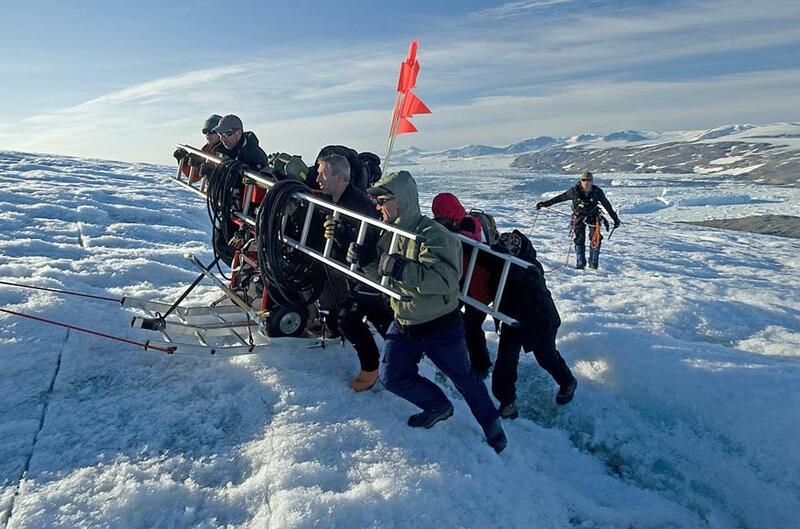 The expedition team of service members, explorers, and scientists from the Coast Guard and North South Polar Inc. transported equipment over a crevasse near Koge Bay in Greenland. In November 1942, a US Coast Guard plane set forth on a daring rescue over the frozen tundra of Greenland, in search of a US Army Air Forces crew who had crashed during a search mission. In a single-engine Grumman Duck aircraft, Lieutenant John Pritchard Jr. and his radioman, Petty Officer 1st Class Benjamin Bottoms, a Massachusetts-based airman, made an unprecedented landing on the forbidding ice cap to rescue two stranded members of the B-17’s crew. But the next day, after trying to save a third man, the plane crashed in whiteout conditions, leaving no survivors. Their bodies were never recovered. Seven decades later, an ­expedition has discovered debris from the lost plane, buried in a glacier near Greenland’s remote southeast coast, the Coast Guard said Monday. penetrating ­radar and metal ­detectors, the 17-member expedition team found black cables consistent with wiring from the aircraft nearly 40 feet below the surface. Additional wreckage was later discovered, confirming the find. The discovery culminated years of painstaking search for the legendary rescue plane. The team consisted of service members, explorers, and scientists from the Coast Guard and North South Polar Inc., which specializes in aircraft ­recoveries. Blow said that military ­records, which included drawings by witnessess, provided only a general sense of where the plane went down. But through radar surveys, the team narrowed the search, then melted 6-inch-wide holes deep into the ice. Lowering a camera into the frigid depths, specialists were able to see bits of wreckage far below the desolate expanse. “You don’t realize how vast that area is until you’re out there,” Blow said. Since the discovery, the military has begun coordinating ­efforts to recover and repatriate the men’s remains, Blow said. 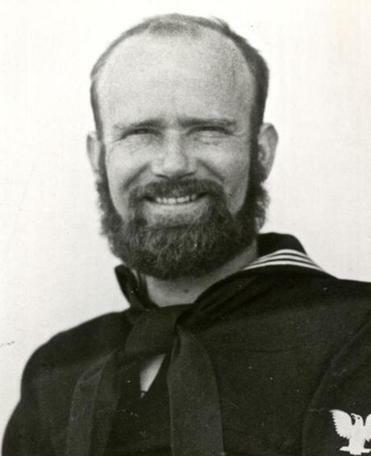 Bottoms, a Georgia native, was based at the Coast Guard Air Station in Salem and in early 1942 became radioman of the aircraft as part of the wartime Greenland patrol. He was married to Olga Bernice ­Bottoms, the daughter of a Gloucester fisherman, according to an official Coast Guard biography. Bottoms’s son, Edward ­Richardson of North Carolina, said Monday that the discovery would bring a measure of closure. “I think it’s wonderful, after all this time,” Richardson, 78, said. Richardson, who grew up in Salem and Gloucester before he moved to Virginia, has fond memories of his father and said his death was hard on him and his mother. For a while, she clung to hope that he was alive and would one day return. His mother, who died in 1984, would be elated to know that his plane had been discovered, he said. Pritchard chose to land on a long downslope where heavy snow blanketed the ice, the AP story reported. He then hiked 4 miles to the survivors, who were “seriously weakened by lack of food and suffering terribly from cold,” the story stated. After picking up two injured airmen, Pritchard took off from the ice without wheels, using the plane’s pontoons to slide and bump along the tundra ­before soaring into the air. “We bumped from hill to hill, each time bounding a little higher, until suddenly we had the old, familiar, smooth sensation of being airborne,” Private Alexander Tucciarone told the news service. The next day, Pritchard and Bottoms again reached the stranded men and took off successfully. But they encountered a heavy snowstorm and crashed. In his last radio message, Bottoms said he needed weather reports. Pritchard and Bottoms, who volunteered for the perilous rescues, were Coast Guard crew members. Jeremiah Manion of the Globe staff contributed to this report. Peter Schworm can be reached at schworm@globe.com.